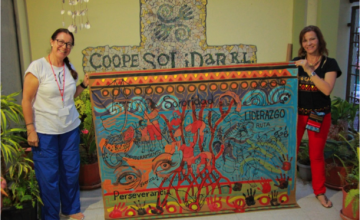 by Vivienne Solis Rivera, ICCA Consortium Council Member with special responsibilities on ICCAs and Gender issues, Member of the International Collective in Support for Fisherworkers (ICSF), and Director of CoopeSolidar R.L. Article directly extracted from Samudra report N°80, published by the ICSF, the International Collective in Support for Fisherworkers. 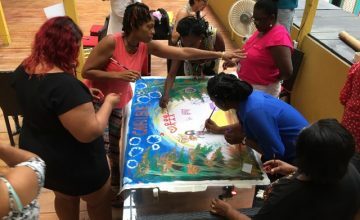 Women from marine fishing communities of Barbados, St Kitts, Grenada, and Belize visited Tárcoles and Chomes in Puntarenas and the Caribbean coast of Costa Rica as part of a women’s learning exchange aimed at strengthening the capacities of fisherwomen in the backdrop of the Voluntary Guidelines for Securing Sustainable Small-Scale Fisheries in the Context of Food Security and Poverty Eradication (the SSF Guidelines). Supported by the Food and Agriculture Organization of the United Nations (FAO), the programme had significant learning elements from the social, economic, cultural and organizational aspects present in artisanal fishing as well as about personal, economic and political/organizational empowerment. The exchange programme had multiple objectives. The first was to acquire an understanding of the experiences of three coastal marine communities in the Pacific and Caribbean regions of Costa Rica. 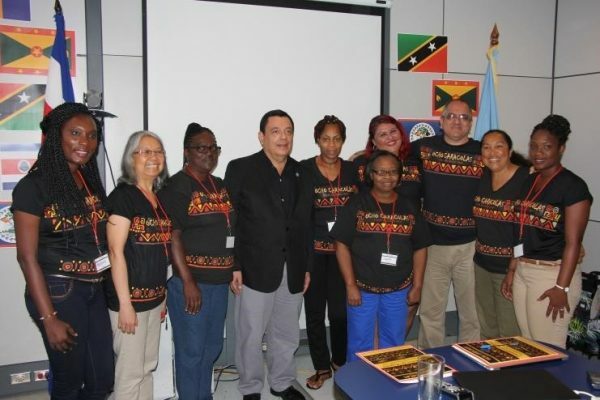 This was by showing good practices of integrated management of fishery resources to provide women in the Caribbean with opportunities to incorporate ideas and innovations intotheir projects and contexts. contribute to the implementation of the SSF Guidelines. The last objective was to demonstrate the benefits of a properly planned learning exchange. Experience One: CoopeTárcoles R.L (Fishers Cooperative of Tárcoles) and ConsorcioPor La Mar R.L. In the first experience, the visitors learned about the management of CoopeTárcoles R.L, its collection centre, the experience of traceability and the sale of fish. The methodology included interactions with key people in the organization, guided tours and rural community tourism. 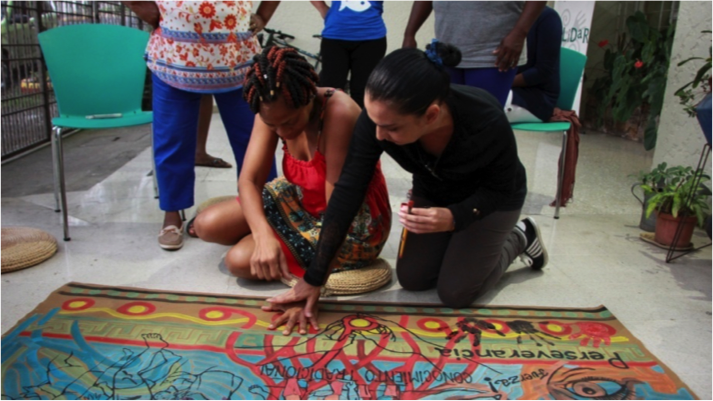 After the analysis of the experience, a space was opened to deepen empowerment of women. This is one of the first steps to strengthen self-esteem, break out of invisibility and assert rights in everyday life and at work as fisherwomen. Leadership, respect, and perseverance are three words constituting the heart of empowerment. Traditional knowledge is linked to the empowerment and identity of fisherwomen, their rights, and necessity for alliances to strengthen the sector. The unity of the group is important. Associated words are consciousness, power, unity, respect, recognition of strengths, and greatness. Other related words are thought, knowledge, rights, model of inspiration, process and support. Three kinds of empowerment could be recognized. While personal empowerment is linked to the recognition of work, opportunities, belief in themselves and self-esteem, organizational empowerment was about taking into account what each woman wants. Thus, listening to eachother to make decisions, horizontal leadership and sorority were important constituents. Economic empowerment was about having fair and equitable access to economic resources. In the case of Tárcoles, income is divided into three parts: boat owner, captain, and the person fishing. “Lujadoras” are part of the guided tours and have an economic payment. They depend on the use of fishing gears. This co-operative has achieved a major milestone in obtaining approval of a Mollusc Sustainable Management Plan, achieved through a participatory organizational effort. On arrival at Chomes, the participants were received with a folk dance that conveyed the culture, knowledge, joy and history of the place, with dancers wearing costumes used for working in mangroves many years ago. Many dancers in the group and the director are sons and daughters of the women of the mangroves, who are members of the CoopeMolusChomes R.L. The next day was a guided tour of the mangrove swamps. The Chomes women explained their work in four stations. 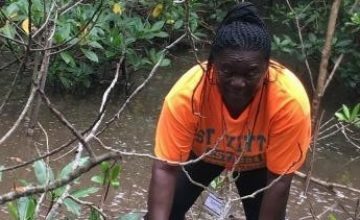 In the first station, they described the process of mollusc extraction in the mangroves, including the mangrove species and the molluscs they harvest as well the dangers they face in their tasks. They also explained in detail the participatory research that has given rise to the Mollusc Sustainable Management Plan and the negotiation process with different actors. In the second station, they shared the obstacles they faced in order to carry out their activities. A major problem was the presence of an aquaculture shrimp company that does not comply with stipulations and regulations. 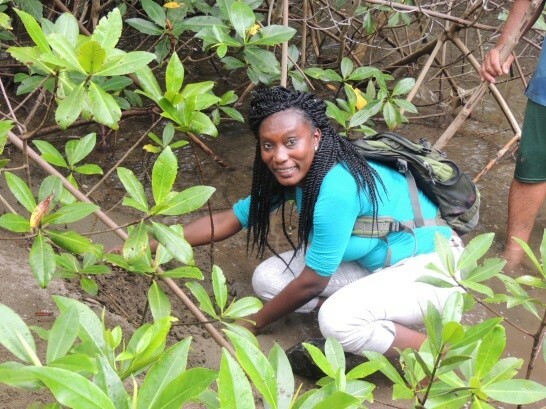 This affects the women and the health of the mangroves. The process of mangrove reforestation and the traditional knowledge of women were discussed in the third stage. 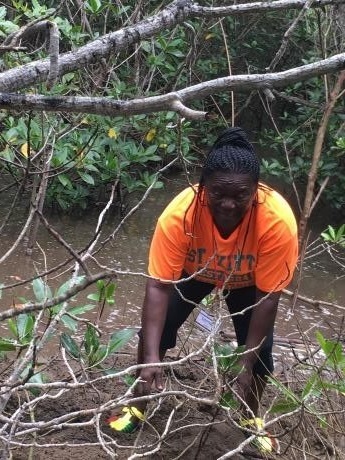 Each participant of the learning exchange planted a mangrove seedling. In the last stage, an entrepreneurship initiative and the value it added were visited. Discussions included various obstacles faced by the local women, including obtaining electricity connections to run their small businesses. 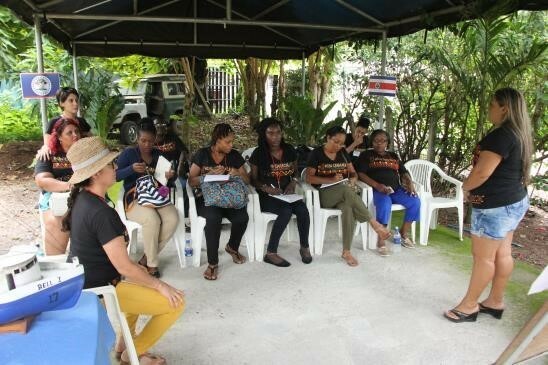 As a mark of solidarity, the visiting women decided to write a letter of support for the women of the Chomes co-operative to be presented to the national authorities. In the third experience, the visitors learned about the experiences and history in the co-management of the resources of a National Park where its inhabitants were always present despite the obstacles they faced. It took many years of dialogue and effort to move towards community leadership and participation. 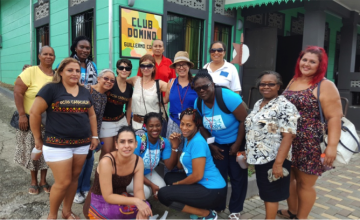 Women benefit from economic initiatives generated around tourism. 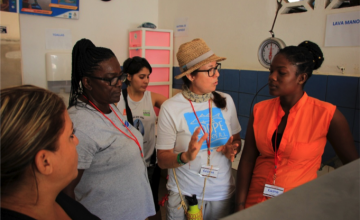 There are women in power and decision-making positions in the Association of Fishers of Cahuita. There must be greater recognition and motivation for women, especially young women, to integrate into the value chain. There is still a need to redouble efforts to fight against climate change, and the search for adaptation measures to erosion that the territory is suffering, as well as the warming in seawaters that affects the coral reefs. Women seemed more affected because they have the responsibility for the food security of their children. As for the Ambassadors of the Sea, they recognized the experience of young people who are entering diving practices and learning opportunities offered by the Diving School, in addition to other activities such as cleaning the seabed and recognition of the sea’s riches. Music: Music is part of the culture. Music means more than just dancing. It is learning from people and traditions. Women expressed their concern about climate change. As heads of households, they were concerned about sedimentation, which is part of climate-change impacts, and pollution and its impact on food security. They saw the need to be more aware of what was used and consumed. They saw youth being models to other young people and said they required opportunities for development. Women had a lot to say about governance. They said that dialogue between government and civil society is important and advantage must be taken of positive leadership such as the Director of the Area, but with the support of the citizens. Local efforts can transform national policies and so lessons learned should be taken to the level of state powers: legislative, executive, judicial and comptroller’s office. Non-governmental organizations (NGOs) that facilitate processes must build bridges between civil society and institutions to produce changes. It was also important to know about international treaties and agreements, among others. They understood the SSF Guidelines as a commitment to resume issues of governance, gender, and organization of the groups of fishers. In Costa Rica, there is an executive decree that has transformed the Guidelines from being voluntary to becoming obligatory, with the participation of different institutions. They then worked on a law, where civil society would give them the elements to advance towards their interests and needs. The process worked because they worked hand-in-hand with the fishers. 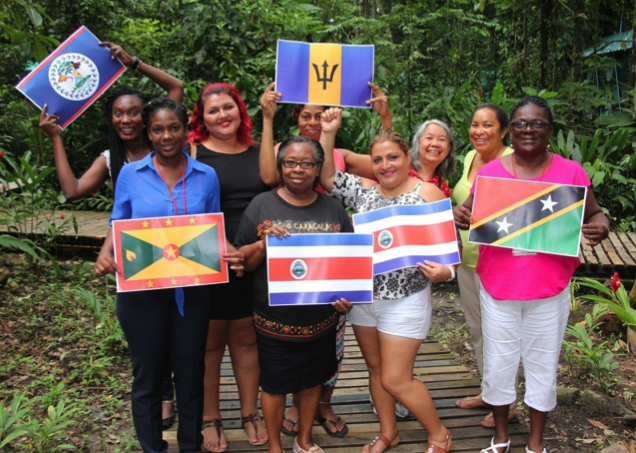 While there are many challenges with respect to gender in fisheries, they would like the Caribbean to be an example from a holistic perspective. Although there are differences between the Pacific and Caribbean coasts, the SSF Guidelines constitute a meeting point for both. The common challenges are women’s empowerment, support from strategic alliances, changes in power relations between men and women, marine responsible fishing areas and economic, social, cultural and environmental opportunities to improve the quality of life of its inhabitants. People learn from practice and experience. Learning is a dynamic and reciprocal process, where meaning is given to experiences and these findings are added to our knowledge repository. Therefore, a lesson learned is evidence that allows us to generate trends from a model of social, economic, political and environmental development, with the idea of multiplying and generating changes, in this case in favour of women and equality. A number of important lessons were learnt from this exchange programme. The role of women is essential in artisanal fisheries and hence it is necessary to generate support policies. The identity of Caribbean women as women of strength, empowerment and leadership needs to be strengthened with the motto “Change starts with me and we continue to work together.” It is important to activate personal and collective will. Perseverance, personal and collective will, and teamwork are essential to achieve goals. Communities, civil society and government need to work together to achieve goals. Perseverance is important to enhance change and it is through education that you can reach young people. It is determining the teamwork and the construction and reproduction of a development model that identifies women in fisheries. As empowered leaders, that knowledge and attitudes must be multiplied with other women in fishing communities and along the value chain. 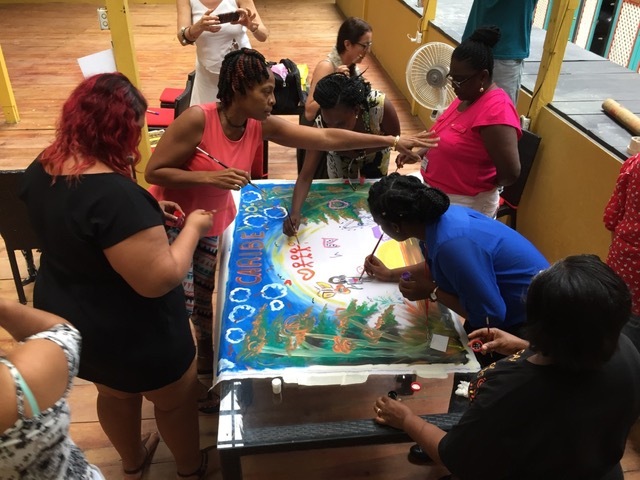 “Sorority” is a keyword that people must put into practice in all women’s empowerment processes – sorority, because it can be seen how the voices of the eight women joined to become one. Empowering other women to walk together by opening spaces to advance the implementation of our human rights and empowering women to make decisions on different issues is fundamental. 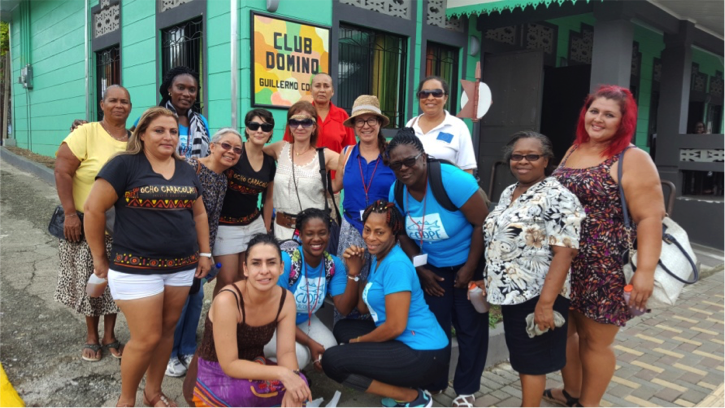 Alliances with other women’s organizations and governments need to be made and optimal environments have to be created for enabling implementation of women’s ideas. Non-interventionist accompaniment in organizations is important. Another lesson is about a holistic approach to the issue of climate change; from prevention to adaptation. Co-management is a shared decision-making possibility that helps to set up opportunities for social, environmental and economic improvement in the lives of fishermen and fisherwomen and from the value chain. Co-management works if given a chance to succeed. Recognition of traditional knowledge of fishers must be ensured. There is a need to rescue cultural traditions in fishing to help strengthen the identity and roots of the fishing communities, as well as their commitment to the restoration of a country and an activity such as responsible fishing, including the contributions of women and young people. There is hope and motivation that change will come soon, especially when women start working together. There is a need to start working towards a better relationship between fisherwomen, with the change beginning with oneself. 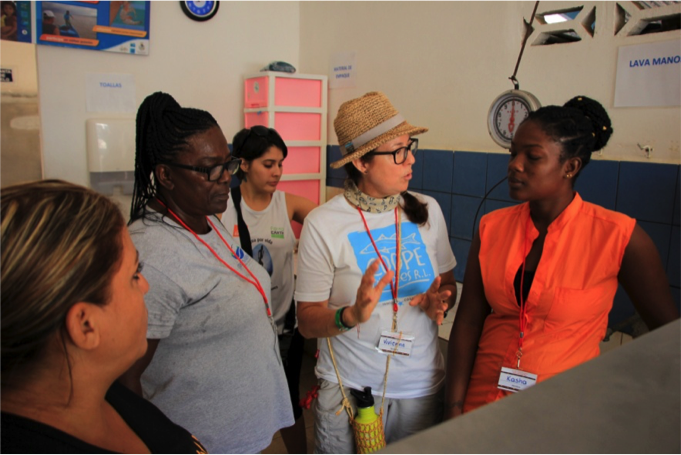 Women in fisheries can support one another through networking and empowering one another. One may stop, scream and cry but rather than allow defeat to take over, one must use all one can, including strengths of other women, to grow. Empowerment and leadership training spaces with, and for, women must be provided on the coast.